«Shkirgalant» has more than a half of a century history. The beginning of it was in 1948, when the factory of sewing mattresses and jerseys was founded in Vinnitsa. In those times the enterprise hadn't a single production basis, but had only several workshops separated around the town. But the enterprise was growing rapidly widening its assortment. Its first haberdashery goods were suitcases. By 1960 the population of the country began to live better and people wanted qualitative clothes and leather-haberdashery accessories. The management of this field made the decision to open gloves production in Vinnitsa. The first workshop of sewing began its work in the building of today's administrative centre of «Shkirgalant». The separated workshops began to work «under one roof» after that. In 1978 the producing power was 3000000 pairs of gloves per year. It happened after the modernization of production basis. The enterprise was of the All-Union meaning. This was the biggest enterprise in the former Soviet Union that supplied the whole civil population of the country and also military and industrial complex. In the USSR the gloves were made by smaller enterprises only in Grodno and Torshzka with the exception to Vinnitsa. In those times producers of gloves didn't have such a wide choice of natural leather materials a it is today, that's why 40% 0f produced gloves were made of leather substitutes. 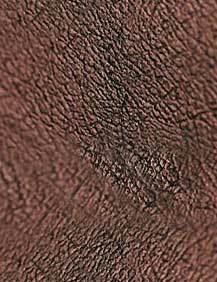 The rest of production was made from swine skin of «Vasilkov leather plant» This leather was of a bad quality. It wasn't so soft and elastic and it didn't have a good trade appearance. The gloves of a better quality were made from the goat leather from India. When the USSR collapsed «Shkirgalant» had difficult times. The markets of sale disappeared and traditional suppliers of materials were closed. A single supplier of leather was «Voznesensk leather plant», but its leather left much to be desired and wasn't good for gloves. The production from this material had a low competition. At the beginning of the 90-s the enterprise was widely cut and only 30 people worked here and made only 10000 pairs of gloves per year. But «Shkirgalant» has made its way through all the difficulties of rebuilding to the market relations, found new suppliers of the materials, new forms of sale and new markets. Today it has leader positions in former and new markets and it attracts the hearts of the users by the beauty and quality of its production!